Quinoa is one the quickest, easiest, and healthiest things you can make in your Instant Pot. But, if you’ve ever tried to make the red variety of quinoa in your pressure cooker using the same method as white quinoa, you may have discovered that it doesn’t exactly come out the same way! Red quinoa inherently has a bit more of a bite than white quinoa regardless of cooking method (think of brown rice vs white), but if you throw your red quinoa into the pressure cooker for just one minute, you will be sorely disappointed. Hence, this recipe! But first, let’s learn more about red quinoa . 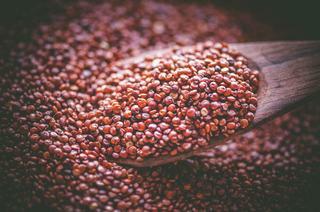 . .
What are the benefits of eating red quinoa? Red quinoa has a high fiber content (even higher than the white variety of quinoa). It is a complete protein (it contains all nine essential amino acids). Red quinoa is rich in zinc, iron, magnesium, calcium, copper and B vitamins. It promotes healthy gut bacteria. 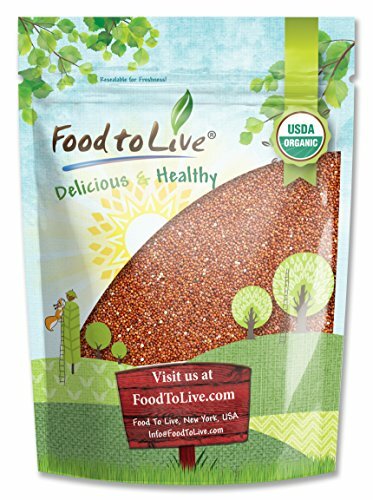 This naturally gluten-free super seed is beneficial for a variety of chronic illnesses and helps provide optimum health! In just a few simple steps, you can have perfectly delicious and fluffy red quinoa straight from the Instant Pot! Instant Pot Red Quinoa uses a 1:1.5 ratio. So for 1 cup of red quinoa, use 1 1/2 cups water. Place rinsed quinoa in Instant Pot with water and salt. Stir. Place the lid on. Make sure the vent is sealed. Cook on manual High Pressure for 14 minutes. Wait 10 minutes then release pressure. Optionally, drizzle with oil and fluff with a fork before serving. is super healthy, flavorful and easy to make. is naturally gluten-free, vegan, nut-free, soy-free and dairy-free. stores and freezes well, making it a great choice for meal prepping. has a wonderfully chewy and nutty texture and flavor. Be certain to rinse your quinoa before placing it into the Instant Pot. Sometimes quinoa contains a bitter outer coating called saponin that can cause digestive irritation if not fully rinsed off. You can double or triple the recipe, just keep the ratio the same. So for 2 cups of quinoa use 3 cups of water. For 3 cups of quinoa use 4 1/2 cups of water. The time will remain the same. You can keep quinoa stored in the refrigerator in airtight containers for up to one week. You can also store in freezer bags or freezer-safe containers for up to 10 months. Just be certain to let the red quinoa cool completely before storing. It isn’t necessary, but I find drizzling the just cooked quinoa with a little olive oil and then fluffing with fork helps separate the grains and lends itself to a fluffier result. I find pre-salted quinoa to be the most versatile for using in dishes, but you can certainly omit the salt for a low-sodium version (quinoa itself is naturally low in sodium). You can add any variety of spices you would like before cooking this pressure cooker red quinoa. I hope you enjoyed this Instant Pot Red Quinoa how-to post! xo. Place quinoa, water, salt into the inner pot of your Instant Pot. 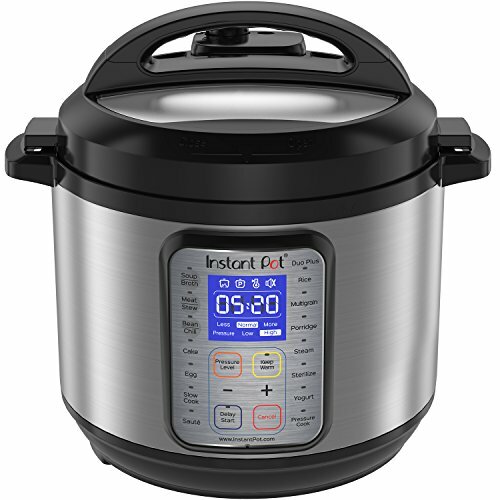 Stir, then put the lid on your Instant Pot and make sure the vent is sealed. Cook on manual high-pressure for 14 minutes. Let the pressure release naturally for 10 minutes and then open the vent and release the steam. Optionally, drizzle with a touch of olive oil and then fluff the quinoa with a fork before serving. Would you like to print this recipe on desktop? Click the green printer icon on the left side of the screen below the social icons. NOTE: Please see 'Tips' above in the blog post for suitable substitutions, storage advice and more! Please Note: You will often find recipes online stating that you can cook red quinoa for the same time as white in a pressure cooker. You can, and it will be edible — but it will not be very tender at all. I experimented with a variety of times and pressure levels, etc., and this recipe is the result of that experimentation. I believe this particular method results in red quinoa with the best texture. And, I hope you think so, too!